Over my holiday break I decided to end my Netflix subscription and try Amazon Prime instead. And as one does when a new streaming services is available, one of the first things I did was put "Beatles" in the search box and see what they had to watch. There were several listings that I wasn't familiar with, but the one that I thought sounded the most interesting was "Scream and Shout: 31 Days that Changed America Forever." It is all about the 1964 North American tour and it promised to show newsreel footage and interviews. Honestly, I did have high hopes from this film. I bought some of those cheaply made VHS tapes in the 1980's/1990's that promised the same thing. They always ended up being a mismatch of familiar footage with no rhyme or reason behind it and always ended with Pete Best on the game show "To Tell the Truth." Boy was I surprised by this film! While the majority of the footage was familiar, there were quite a few clips that were brand new to me and I really enjoyed seeing. The ones that were familiar weren't news footage that I had seen a million times either -- they were ones that haven't been shown too often. And I loved that the film was in chronological order -- so it started in San Francisco (well actually LAX) and ended in New York. Whoever put this film together really did a nice job organizing the material so that it went in the right order. When I first started watching, I was pleasantly shocked to see that one of the guys that comments on this blog and I have communicated with one many occasions over the years, Mark Naboshek was one of the main people interviewed for the film. Mark has an amazing collection of Beatles memorabilia and he knows his Beatles tour stuff, so I knew the documentary had to better than most with Mark featured in it. However -- some of the other interviews I could have done without. There was a lot of non-Beatles music featured that I guess was supposed to be "Beatle-esque." They interviewed some of the musicians of this new music and I thought it took away from the story. Sure hearing an 11 year old boy talk about his love for the Beatles is nice, but what did that have to do with the 1964 tour? There's a lot of fan footage in this film, which I enjoy because I love seeing the fans from the Beatles touring years, but if you find that to be boring -- you might want to skip this one, or watch it with a remote to fast forward handy. 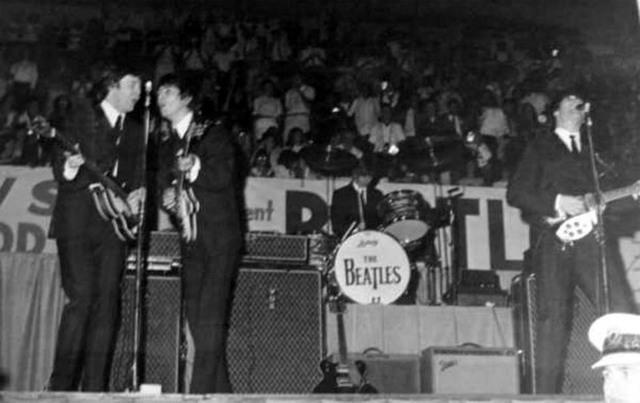 I think it adds to the charm of the tour and reminds us how insane Beatlemania really was. This is a film that most fans will want to see at least once and I know I plan on watching it again. So if you already have Amazon Prime, check it out! If you don't -- a DVD is available. What show on the '64 US tour is the photo from? I thought Las Vegas but I think the backdrop is different? I should have put that in the caption -- sorry. It is Cincinnatti. Thanks for the info, Sara. Keep up the great work! Thanks for the kind words, Sara. I don't even have this final version of the film. Mine is the longer original cut, before it had to be edited down for the consumer market. Andy Timmons and I were filmed for it in the summer of 2012, so almost 6 years ago. Andy's an amazing musician -- a guitar virtuoso. So talented and a very knowledgeable Beatles fan. He was Olivia Newton-John's musical director (and concert guitarist) for many years. A few years ago, he released an instrumental version of the Sgt. Pepper LP that's nothing less than astonishing. It got lots of press and rave reviews when it came out and anyone who hasn't heard it, NEEDS to hear it. Entire songs from it can be found on YouTube. I highly recommend his version of "Within You, Without You" (which I know is on YouTube). Anyway, thanks again for the kind words. The director (and editor) Robert Greeson worked very hard on this documentary, trying to make it accurate while making sense of all the footage. A friend of ours, Ron Patton of SC, formerly of Texas, gave us your name as a Beatles collector par excellence. My wife has had, since 1965, an autographed picture of Paul McCartney complete with a strand of his hair. She got it from a high-school friend who was president of a Beatles fan club and who swore that it was the genuine article. She is aware that the “boys” routinely signed each other’s names, as well as non-Beatle persons. Might you know of a way to have this item authenticated? Any help or advice would be appreciated. Thank you. A friend of ours, Ron Patton of SC, gave us your name as a Beatles collector par excellence. My wife has had a photograph of Paul McCartney since 1965. It is autographed and has a strand of his hair. She got it from a high-school friend who was the president of a Beatles fan club who swore that it was the genuine article. Would you know of a way to get this authenticated? She is aware of the fact that the “boys” routinely signed each others’ names as did various and sundry non-Beatles. Any help or advice would be appreciated. Thank you.